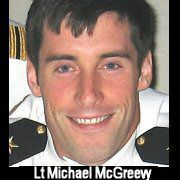 In honor of Navy Lieutenant Michael McGreevy, 30, of Portville, NY, who was killed in Afghanistan June 28. With heavy hearts we offer our prayers and condolences to his wife, Laura, and 14-month-old daughter, Molly. The price of freedom, and its worth, is found in Michaelï¿½s passing. The debt owed to Michael and his family can never be repaid but only honored by remembering Michael and remaining free.